Figure 1. Locations of OBS deployed during the cruise. Red and yellow circles indicate planned and actual locations for the 24 OBSs, superimposed on bathymetry data (Left and bottom right). Google Map showing the location of Newport and photo of R/V Oceanus (top right). 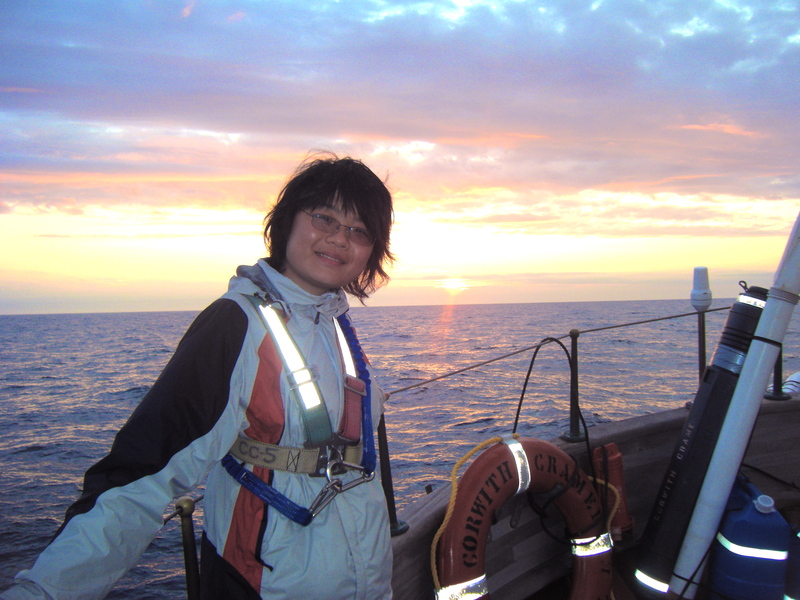 The first day I stepped onto the R/V Oceanus it was hard for me to hide my excitement. As a fourth year PhD student in marine geophysics, I have looked at a lot of Ocean Bottom Seismometer (OBS) data from other cruises and this would be my first time participating in real time OBS deployments! The Cascadia subduction zone stretches from Vancouver to northern California, and the Cascadia Initiative is aimed to investigate the subduction zone off-shore Washington and Oregon. During this cruise, September 10 to 20, 2012, we deployed 24 OBSs off shore from 45.5° to 40°N. 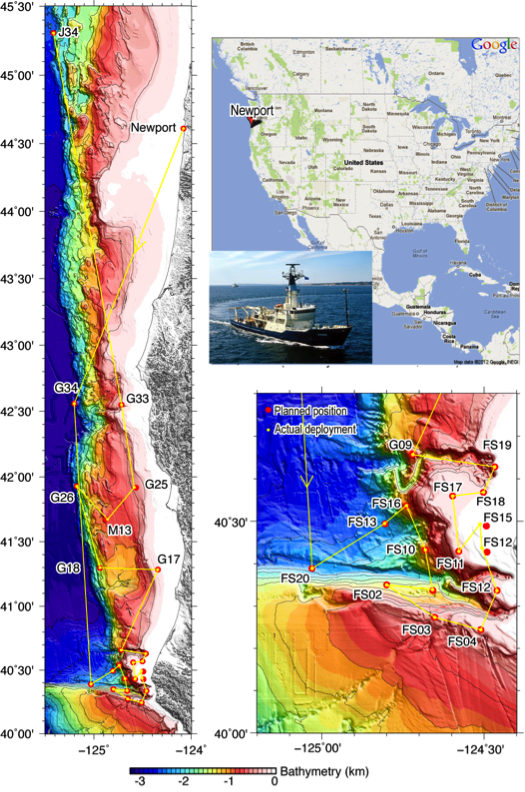 Our cruise track is leg 6 of the Cascadia Initiative Expeditions in 2012. This area could be a future origin of earthquakes and earthquake-triggered tsunamis and is under careful watch of scientists. 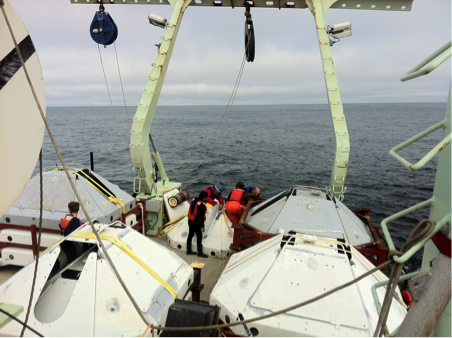 The objective of deploying OBSs is to record local and distant earthquakes, in order to determine the local crustal structure the frequency of earthquakes in the Cascadia subduction zone. Figure 2. 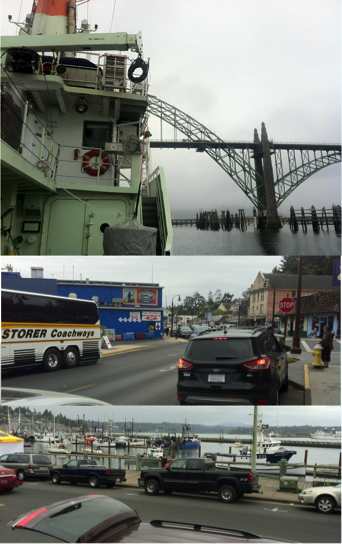 R/V Oceanus pulling into the port (top) and the streets of Newport (bottom two photos). Newport is a small seaside town with a single main street crowded with gift shops and restaurants. Jeff, a seismologist from WHOI and co-chief for this cruise, told us that sometimes it could be quite empty and quiet, even in the summer. The town felt much bigger than Woods Hole, and the port was definitely larger than the one at WHOI. Our lab group from WHOI arrived one day before the cruise started. We didn’t explore Newport a lot, but we had a good lunch at a cafe where the fresh crab cake was delicious. Anne, the chief scientist from Oregon State University, invited us to a welcome dinner at Rogue Brewery (she said that it was a tradition) where different kinds of beers were provided. I am not a big fan of beer, to tell the truth, but I bought a very cute glass mug to use during the cruise to celebrate our visit to the brewery. Figure 3. Safety drill with survival suits. The first day aboard the ship began with a safety drill that was easy and took about an hour to complete. I took a photo of some of us struggling into survival suits (Figure 3). These suits could keep you alive for quite awhile if you were thrown into the freezing waters of the ocean. Everyone seemed to enjoy the process, looking cute and small inside the over-sized survival suits. In the middle of the cruise, we had a man overboard drill. We made a dummy out of wood and iron, and threw it into the sea to simulate a situation where a person needed rescue. My job during the drill was to point to the “victim” in order to let the helmsman, David, know where our “victim” was in the ocean. I found it very interesting working with engineers the first afternoon of the cruise. Ted, one of our talented engineers, taught us how to use electric screw drivers and a unistrut (a standard metal structure to support wiring) to make a rack specifically designed for the R/V Oceanus to store the OBSs. As I noticed later, the engineers were always busier than us, constantly reassembling the sensor package and tuning all the OBS parts. David and Vince, two more engineers aboard, even missed the welcome dinner because they needed to write codes for the expedition. Figure 4. Sunrise on a windy day. On September 11th, the weather report said, “North wind 25-35 knots combined with seas 13-17 feet.” It was time to get seasick. Luckily, I had taken one seasickness pill before our departure. Our two experienced chief scientists, Anne Trehu (OSU) and Jeff McGruire (WHOI) suggested that I take a “coastal guard cocktail” and wear a seasickness pad. After the cruise, I found out from a website that the “coastal guard cocktail” is a combination of 25mg of promethazine and 25mg of ephedrine. I hope I won’t need seasick medicine again, but who knows? I’ll be bringing it with me the next time I go out on a cruise — better to be well prepared than to be seasick. 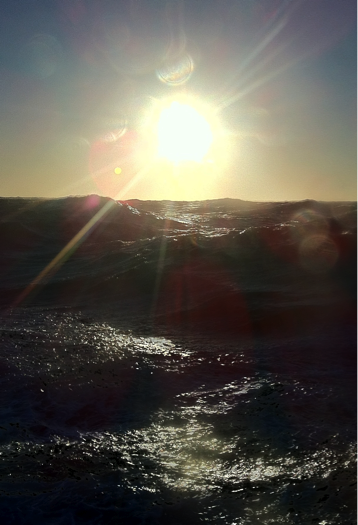 Seasickness wasn’t the only trouble caused by the northern winds; OBS deployment is difficult in bad weather. So Anne decided to modify our deployment order: Skip the most northern site (J34), which is north of Newport and far from the main deployment region, and head directly to the sites south of Newport in the first two days. By going South, we then took advantage of the wind and ended up steaming at a relatively high speed and transiting back north to J34 after that. It was a clever decision, because when we arrived at G34 (our southern-most site), the wind stopped and we were able to finish our deployments two days earlier than our cruise plan. Food is an incredibly important part of life at sea. Our amazing steward, Crist, provided excellent food during the entire cruise (also, thanks to the assistant steward, Tyler). Fried codfish, ribs, and salmon cakes were among my favorite dinner dishes. They also made a variety of cakes and muffins for breakfast and dessert. Coffee, fruits, and cookies were provided all day long. On the boat, people in different watches might need food during the day or late at night, so you could always get some left-overs from the freezer or make a sandwich yourself if you missed a meal. I felt very lucky on this cruise; the galley on the R/V Oceanus was actually much better than the one on my last cruise. Figure 5. 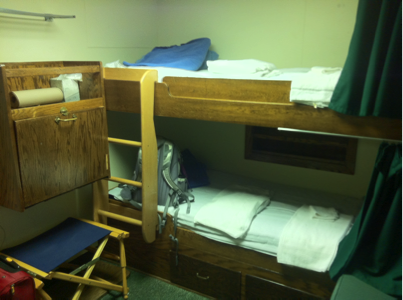 My bunk aboard R/V Oceanus shared with my roommate McKenzie. The R/V Oceanus might be not as roomy as some ships, but it is spacious enough. There is a library, a computer room, and a laundry room. The library was used for entertainment– some of the crew and the science party watched movies in there after their watches. My roommate, McKenzie, managed to finish reading one of the books stocked in the library during our cruise and found it very interesting. My bedroom was underneath the water line. During the night, I could hear the waves hitting the hull: it was annoying, especially during the first two windy days, and I would’ve liked to have skipped it if possible. Our bunk was reasonably sized and we had a folded desk and an Internet cable (although the signal was intermittent). We shared a bathroom that was small and was required to be cleaned by ourselves. These were the spaces we spent most of our time after our daily 12-hour watches. 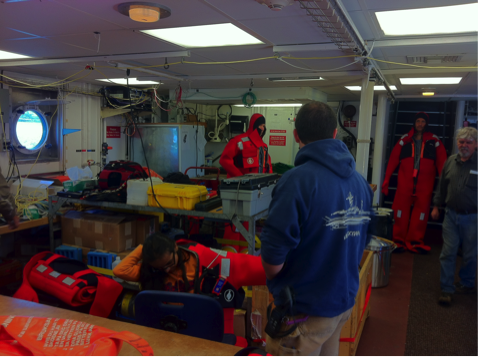 Now it’s time to explain the science we were doing aboard the ship: Deploying ocean bottom seismometers. The engineers did most of the assembling and deployment work, and we kept a written and online log survey operations: arrival time at a site, which OBSs went in the water and surfaced, site survey information for the OBS locations, start and stop times for echo-sound data readings, and other important notes regarding our deployments and instruments. We had 14 OBSs with trapezoidal travel-resistant enclosures and 10 without them. When there is travel-resistant enclosure for the OBS, it is required to be deployed with a long wire connection to the ship until it reaches the seafloor (Figure 7). If there is no enclosure, the OBS is released without wire connection before it reaches the seafloor. Figure 6. OBSs (right) and their rack (left). My watch shift was from 4am to 4pm, and our work was essentially writing the log, and reading the echo-sound data from the OBS. Sometimes we were able to help the engineers resemble the sensors. We made some minor modifications as to where the OBS drop sites were because the seafloor of a good drop site should be smooth and flat. There were sites whose bathymetry data were too rough to judge, thus we kept an eye on the real-time echo-sound screen in order to compare the seafloor with our bathymetry map. The echo-sound data helped us re-assign some drop sites to better locations. Figure 7. 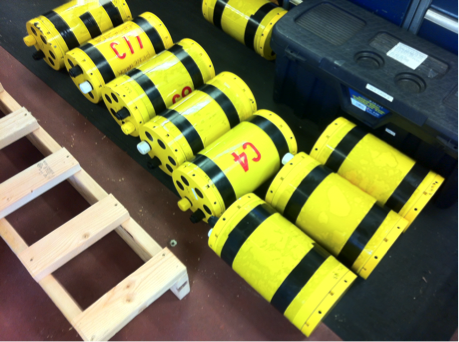 Preparations before deployment of a travel-resistant OBS. Early on the morning of September 16th, Jeff and two students, Angie and Ben, saw methane gas bubbles in the echo-sounder 12kHz image near our location, G9. Anne was very excited about it because she has been doing relevant methane bubble research for about ten years. She called it “underwater champagne” and it was time to celebrate that day. Figure 8. 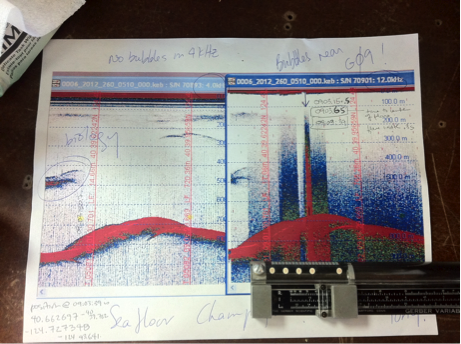 Echosound images of a seamount at 4 kHz (left) and 12 kHz (right). Only 12kHz shows a methane bubble plume (marked by an arrow) on the top of the seamount. The bubble plumes exist at ~ 500m depth, corresponding to the underwater temperature-pressure (T-P) condition where the gas is stable. The bubble plumes often rise from the top of a seamount if there are oversaturated gas sources and vents for those gases to leak out. We were able to identify those methane bubble plumes as being different from biological sources because they only show up in 12 kHz sound-echo images and not 4 kHz sound-echo images, while biological sources have signals in both frequencies images. It was a re-visit to Anne’s previous discovery of methane bubble plumes on the Cascadia margin (Heeschen et al., 2003). But it was my first time to see it and so I sort of experienced the process of a new discovery. That was the most exciting day for me during the cruise, which definitely deserved “champagne.” (Wait, not real champagne of course, because alcohol is prohibited on NSF funded cruises.) Between September 16-20, we continued trying to find other bubbles and I think we found one near location G33. Scientists have discovered hundreds of plumes of methane gas on the Arctic seafloor and huge methane gas bubbles at the bottom of the Gulf of Mexico. Methane gas bubbles have the potential to be dangerous because it’s possible for these methane bubbles to cause a gas explosion, rupture the seabed, and cause tsunamis. I think it is a possible energy source in the future only with mature safety control and exploration techniques. I just found a relevant article saying, “there is some belief that methane bubbles have been the cause of disappearing ships and airplanes in the Bermuda Triangles” (Maggie’s Notebook). I may need to check out the theory later, but for right now, I am just sharing it for fun! a. Instant hand sanitizer (maybe provided on the boat), medicated wipes, soap, sunglasses, hand sunblock, gloves, an eye mask, pens, and a flashlight. I also suggest hand lotion, Carmex analgesic, and Tiger balm (a Chinese ointment). b. 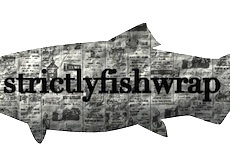 Reading materials, music, Kindle/Nook/ipad, laptop, passport, cruise documents. c. Water-proof, fast-drying clothes, towels etc. d. Rubber boots, slippers, and hiking boots. Heeschen, Katja U., Anne M. Tréhu, Robert W. Collier, Erwin Suess, and Gregor Rehder. 2003. “Distribution and height of methane bubble plumes on the Cascadia Margin characterized by acoustic imaging.” Geophysical Research Letters 30 (12) (June 26): 1643. doi:10.1029/2003GL016974.